It’s no secret that I’m a fan of maple in cocktails. Maple syrup has a wonderful sweetness and a unique flavor that compliments all kinds of spirits, especially whiskey and bourbon. Instead of using simple syrup, I often use maple syrup to add a unique character, as well as some sweetness, to my cocktails. 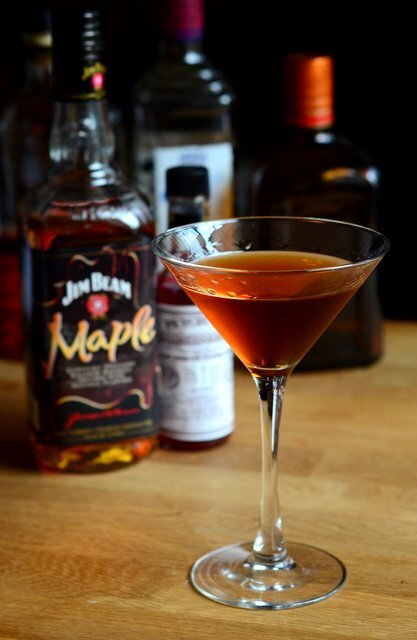 When I tried Jim Beam Maple, I knew that it would be a great spirit to work with when building cocktails because it already has that strong maple flavor and a noticeable sweetness to it. Here, I used it in a Maple Manhattan. A Manhattan is a classic, slightly bitter cocktail that is made with whiskey, sweet vermouth and a splash of bitters. The maple flavor of the Jim Beam works well with the sweet vermouth, tempering some of its stronger herbal notes and giving the drink a very smooth quality. Although the maple whiskey is slightly sweet, it doesn’t turn this into a sweet cocktail by any stretch, but it does make one that is very easy to drink – especially when you like maple to begin with. Fill a cocktail glass with ice to chill. When chilled dump the ice out and set aside. 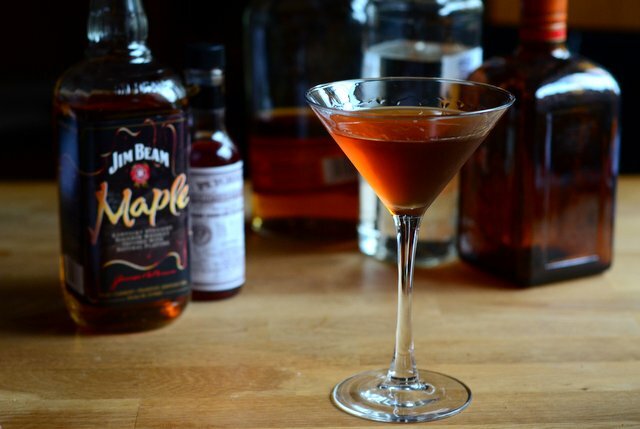 Pour the Jim Beam Maple, and sweet vermouth into a mixing glass. Add two dashes of bitters, fill with ice, and stir for about 30 seconds until chilled. Strain into the prepared cocktail glass.